The other day, my daughter sent me one of those little quizzes that are all over the internet. It said if I had done/could check off 22/30 I had a VENTI sized Starbucks problem. Well....I think I have a TRENTA sized Starbucks problem because I got 27/30! I'm on my fourth week working at Starbucks and I totally love it! I even bought some Cold Brew Packets so I could brew my own at home - that stuff is FREAKING AWESOME!! 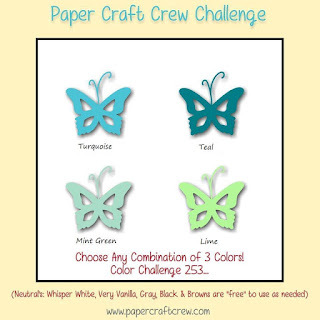 Anyway....all that to say, this week our challenge at the Paper Craft Crew was a colour challenge! 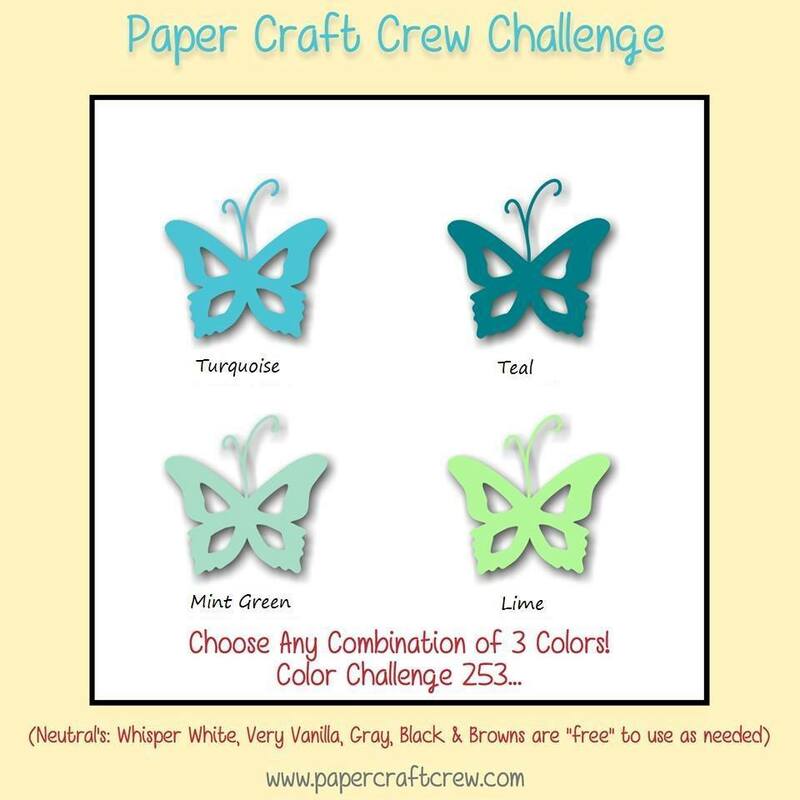 I'm calling the Designer Series Paper "Turquoise" and the Bermuda Bay is my "Teal". That works, right? *wink* The lime green is pretty obvious in the Lemon Lime Twist. What do you think of that Ombré Ribbon? I love it! And I'm SO happy it comes in THREE colours! It's Christmas in July...but also all the back-to-school stuff is starting to show up - LOL! I love summer, don't get me wrong...but I LOVE routine even more and CRAVE back-to-school time when everything runs "tickety-boo" and everyone has a place to be at a certain time of day. 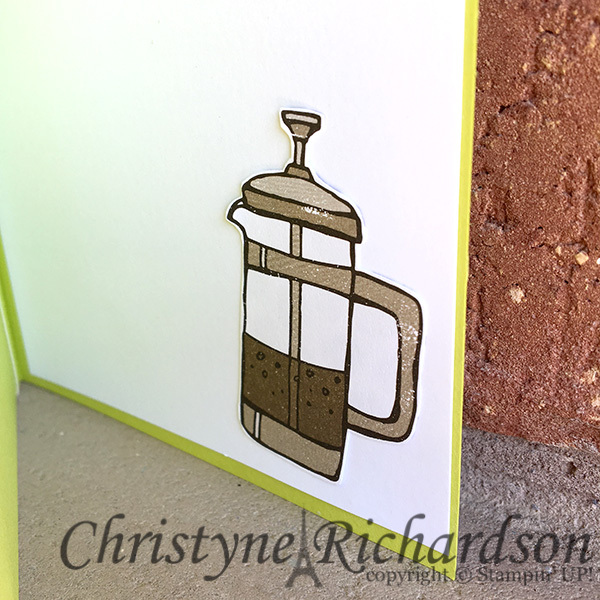 Anyway...today's card has NOTHING to do with back-to-school, but EVERYTHING to do with my "Christmas in July" class on July 29th. I started off with a base of Soft Suede and added a layer of Whisper White. 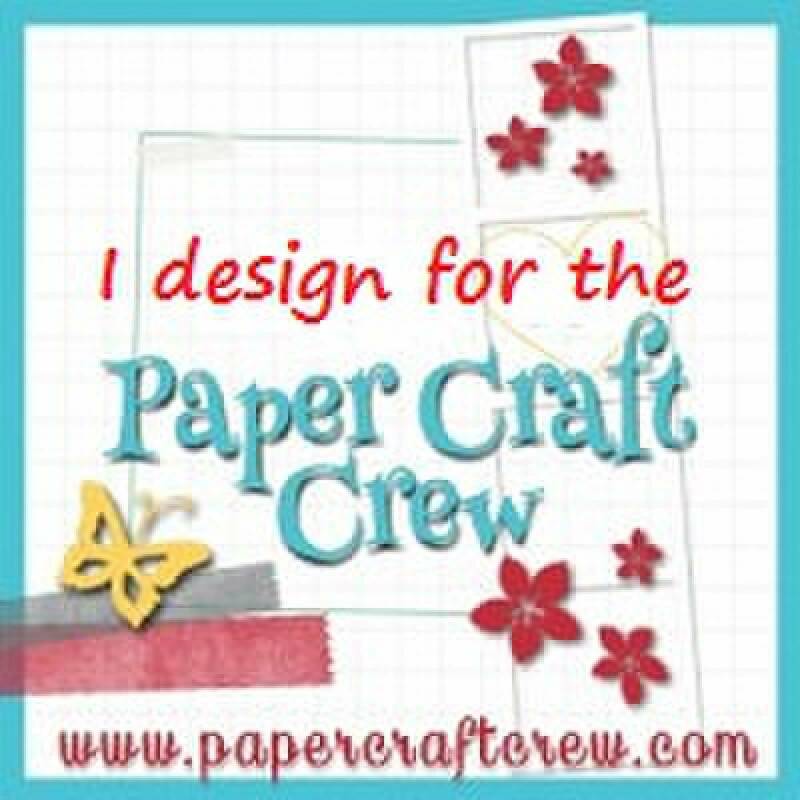 To that, I added a small square of Be Merry Designer Series Paper (new in the 2017-2018 annual catalogue) and a smaller square of Whisper White Cardstock. I added the little reindeer and the sentiment from the Merry Mistletoe set. 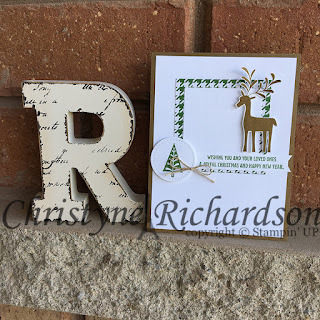 The tree off to the left is from the same set and it was stamped onto more Whisper White Cardstock and cut out using the Big Shot and the smallest of the circles in the Stitched Shapes Framelits set. The finishing touch was a little bit of linen thread tied into a bow...because who doesn't love linen thread?? While I haven't had the stamp set I used today "forever", it is definitely new (available in the new 2017-2018 Annual Catalogue) and I have had it for about 2 months. Super cute, right? 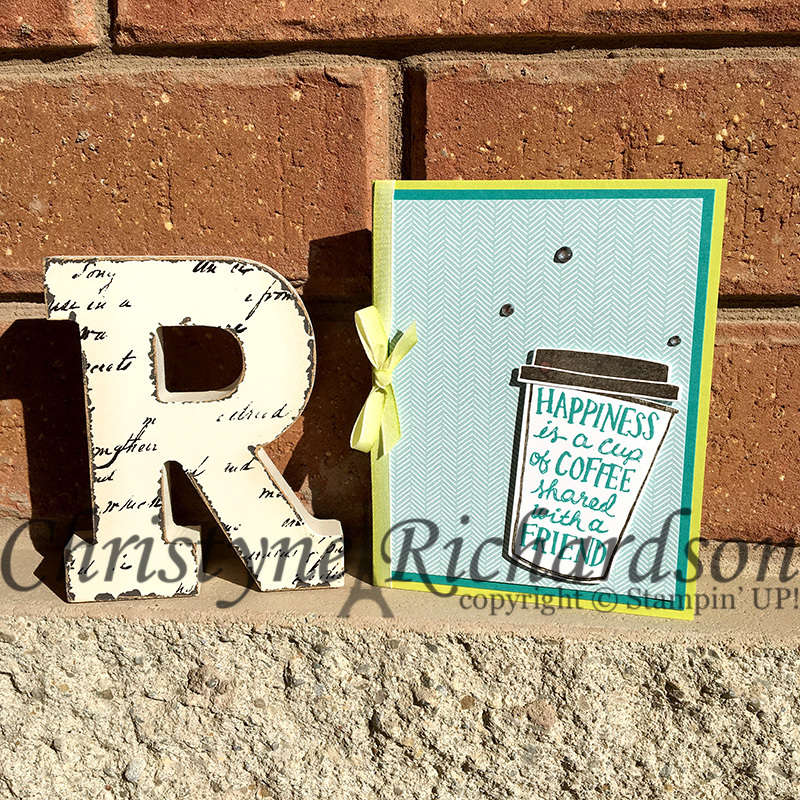 I used the sentiment from Label Me Pretty and stamped it in Bermuda Bay unto Whisper White Cardstock and punched it out using the coordinating punch which is part of the bundle. I had grand illusions of baking some cookies that I could then package up and attach the tag to, but I recently started a new job at Starbucks (I LOVE IT!!) and time has gotten away from me! After I stamped and punched the sentiment, I cut out the tag and added the layer of Bermuda Bay Cardstock which I stamped using images from Touches of Texture. 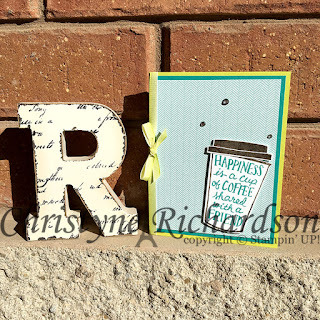 I then added a length of Soft Sky Classic Weave Ribbon and attached the sentiment on top using Stampin' Dimensionals. I added some Bermuda Bay Stitched Satin Ribbon and tied it up with my FAVOURITE linen thread for the finishing touch.